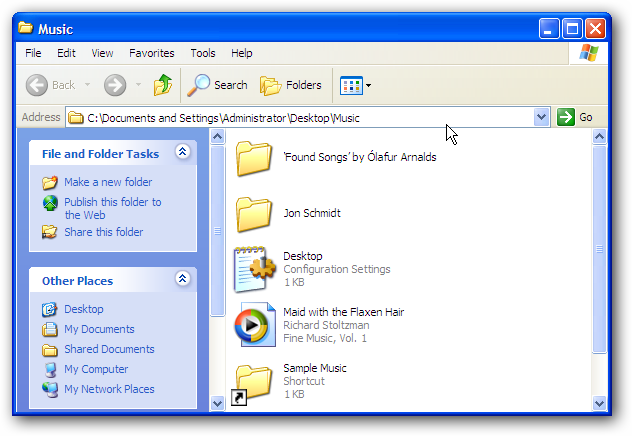 Want to easily access folders and files from different folders without maintaining duplicate copies? Here’s how you can use Symbolic Links to link anything in Windows 10, 8, 7, Vista, XP, and Ubuntu. So What Are Symbolic Links Anyway? Symbolic links, otherwise known as symlinks, are basically advanced shortcuts. You can create symbolic links to individual files or folders, and then these will appear like they are stored in the folder with the symbolic link even though the symbolic link only points to their real location. There are two types of symbolic links: hard and soft. Soft symbolic links work essentially the same as a standard shortcut. 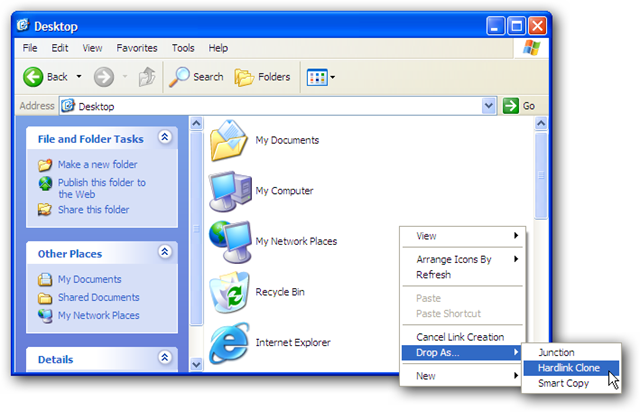 When you open a soft link, you will be redirected to the folder where the files are stored. However, a hard link makes it appear as though the file or folder actually exists at the location of the symbolic link, and your applications won’t know any different. Thus, hard links are of the most interest in this article. 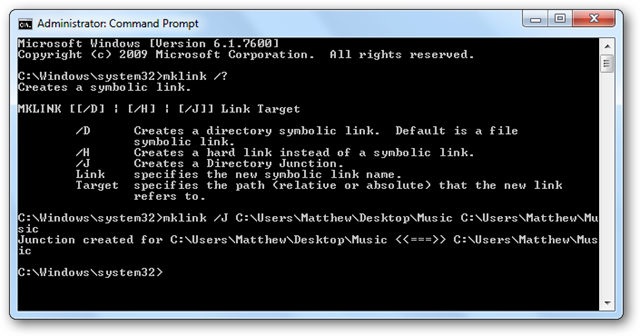 Follow the correct instructions below for your operating system to create the symbolic link. Caution: Make sure to never create a symbolic link inside of a symbolic link. For instance, don’t create a symbolic link to a file that’s contained in a symbolic linked folder. This can create a loop, which can cause millions of problems you don’t want to deal with. Seriously. Creating symlinks is usually difficult, but thanks to the free Link Shell Extension, you can create symbolic links in all modern version of Windows pain-free. 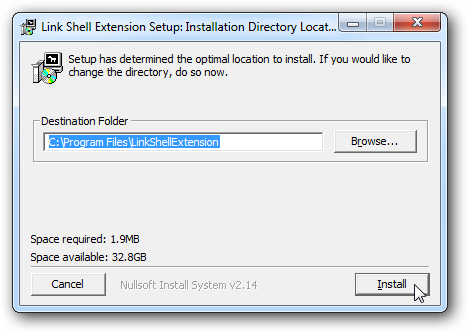 You need to download both Visual Studio 2005 redistributable, which contains the necessary prerequisites, and Link Shell Extension itself (links below). Download the correct version (32 bit or 64 bit) for your computer. 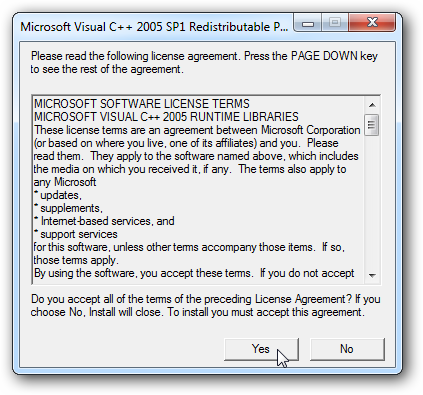 Run and install the Visual Studio 2005 Redistributable installer first. Then install the Link Shell Extension on your computer. Your taskbar will temporally disappear during the install, but will quickly come back. Now you’re ready to start creating symbolic links. 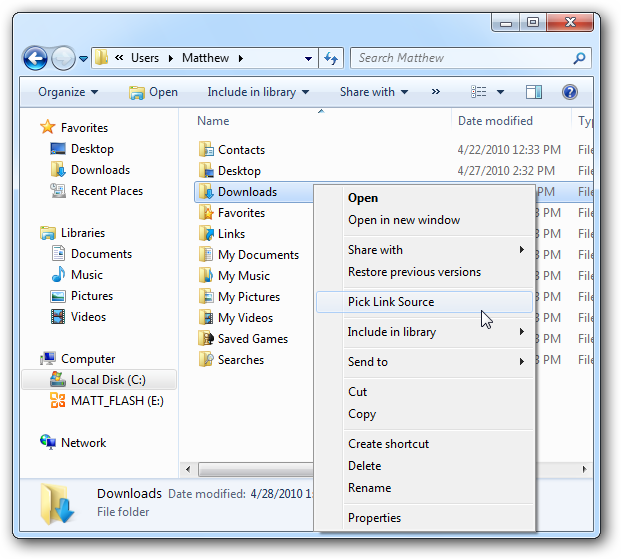 Browse to the folder or file you want to create a symbolic link from. 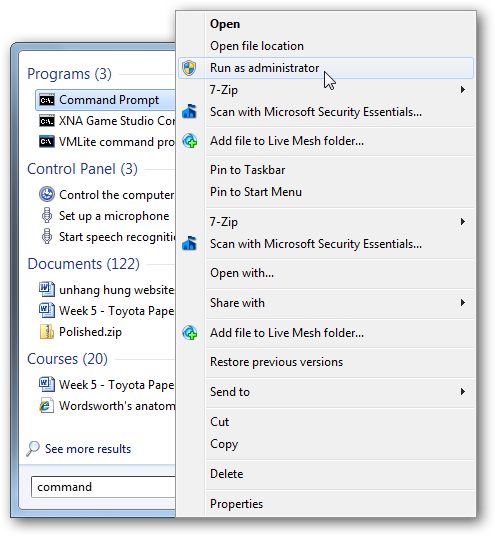 Right-click the folder or file and select Pick Link Source. To create your symlink, right-click in the folder you wish to save the symbolic link, select “Drop as…”, and then choose the type of link you want. You can choose from several different options here; we chose the Hardlink Clone. 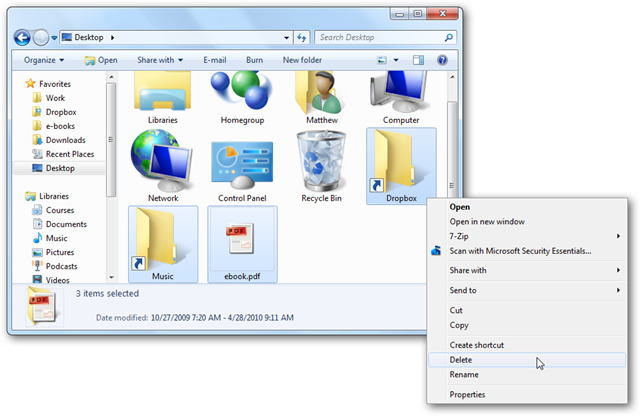 This will create a hard link to the file or folder we selected. The Symbolic link option creates a soft link, while the smart copy will fully copy a folder containing symbolic links without breaking them. These options can be useful as well. Here’s our hard-linked folder on our desktop. 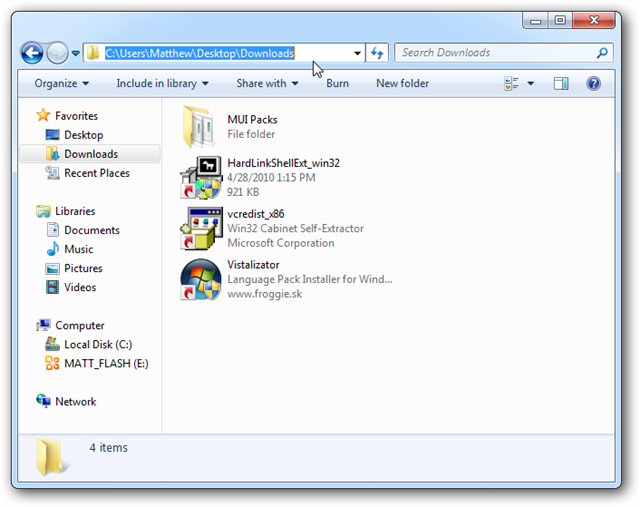 Notice that the folder looks like its contents are stored in Desktop\Downloads, when they are actually stored in C:\Users\Matthew\Desktop\Downloads. Also, when links are created with the Link Shell Extension, they have a red arrow on them so you can still differentiate them. And, this works the same way in XP as well. Or, for geeks who prefer working via command line, here’s how you can create symlinks in Command Prompt in any version of Windows. 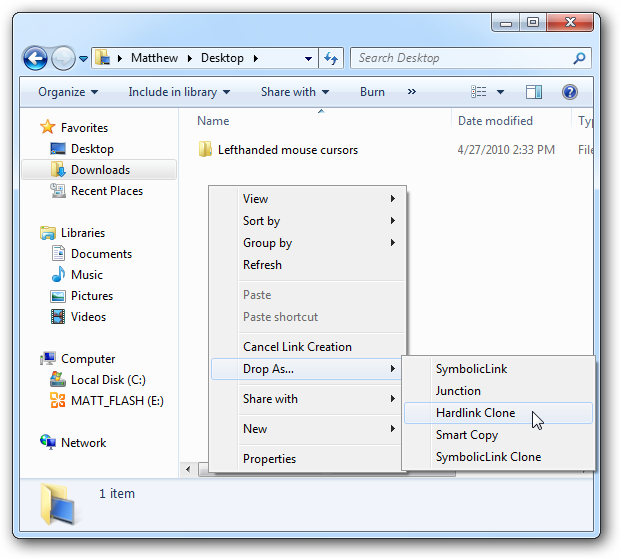 In Windows Vista and 7, we’ll use the mklink command to create symbolic links. To use it, we have to open an administrator Command Prompt. 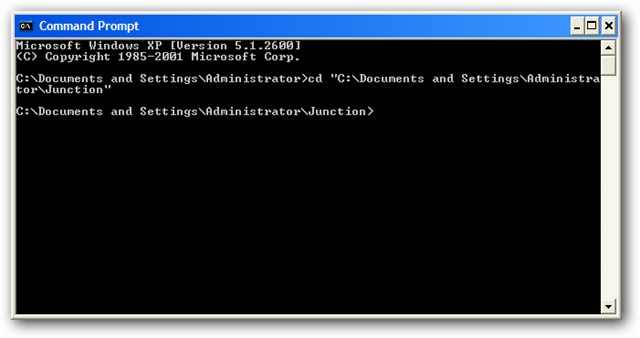 Enter “command” in your start menu search, right-click on Command Prompt, and select “Run as administrator”. Note that the first path was to the symbolic folder I wanted to create, while the second path was to the real folder. 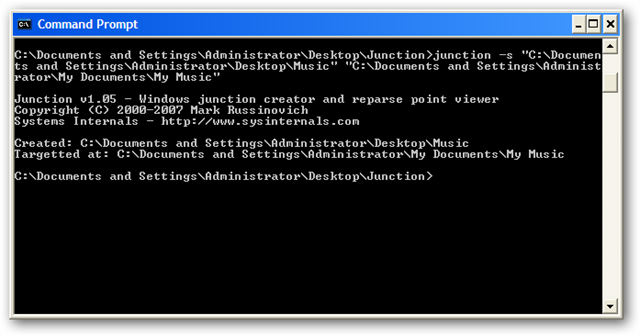 Here, in this command prompt screenshot, you can see that I created a symbolic link of my Music folder to my desktop. And here’s how it looks in Explorer. Note that all of my music is “really” stored in C:\Users\Matthew\Music, but here it looks like it is stored in C:\Users\Matthew\Desktop\Music. Windows XP doesn’t include built-in command prompt support for symbolic links, but we can use the free Junction tool instead. Download Junction (link below), and unzip the folder. Now open Command Prompt (click Start, select All Programs, then Accessories, and select Command Prompt), and enter cd followed by the path of the folder where you saved Junction. As with mklink in Windows 7 or Vista, if your file/folder path has spaces in it make sure to put quotes around your paths. Also, as usual, your symlink can have a different name that the file/folder it points to. And here’s the contents of our symlink. 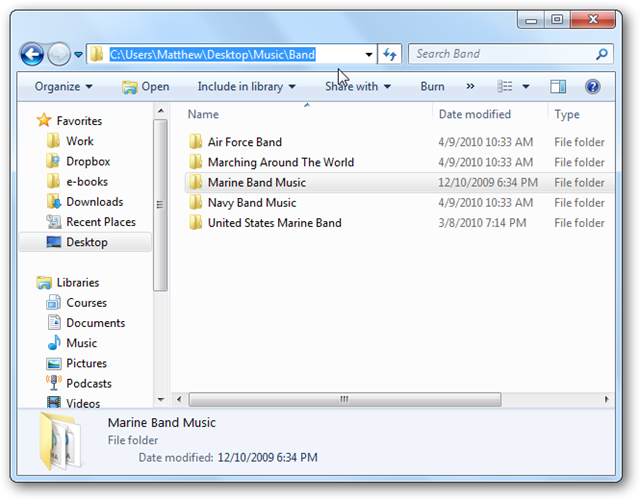 Note that the path looks like these files are stored in a Music folder directly on the Desktop, when they are actually stored in My Documents\My Music. Once again, this works with both folders and individual files. Please Note: Junction would work the same in Windows 7 or Vista, but since they include a built-in symbolic link tool we found it better to use it on those versions of Windows. Unix-based operating systems have supported symbolic links since their inception, so it is straightforward to create symbolic links in Linux distros such as Ubuntu. There’s no graphical way to create them like the Link Shell Extension for Windows, so we’ll just do it in Terminal. Note that this is opposite of the Windows commands; you put the source for the link first, and then the path second. Once again, here is the contents of our symlink folder. 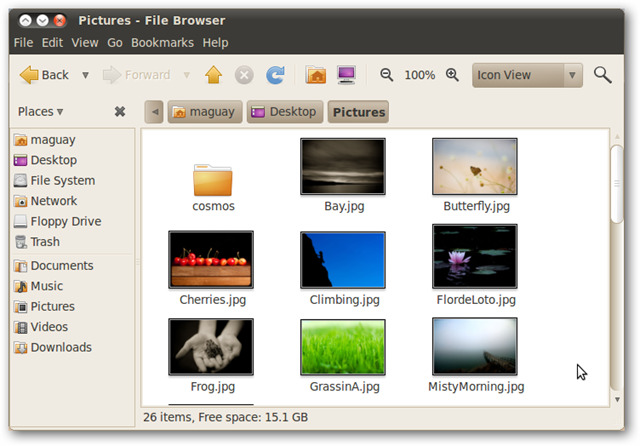 The pictures look as if they’re stored directly in a Pictures folder on the Desktop, but they are actually stored in maguay\Pictures. Removing symbolic links is very simple – just delete the link! Most of the command line utilities offer a way to delete a symbolic link via command prompt, but you don’t need to go to the trouble. Symbolic links can be very handy, and we use them constantly to help us stay organized and keep our hard drives from overflowing. Let us know how you use symbolic links on your computers!